The most commonly torn tendon in the adult foot and ankle population is the posterior tibial tendon. This is the tendon that goes down the inside of the ankle and allows you to go up on your toes and to push off when you walk. This tendon is commonly torn in women around 60 years of age and leads to a progressive flatfoot deformity. It can also occur with trauma, but most of the patients who have a posterior tibial tendon tear have a longstanding flatfoot, and then with repetitive loads over the years the tendon finally gives out. Once the tendon tears, the ligaments which connect the bones in your foot start to stretch out and the foot becomes progressively flat. Patients typically complain of an inability to walk on their toes. They walk with their foot pointed outside. They complain of pain and swelling on the inside of their ankle that makes walking any distance difficult. This is commonly misdiagnosed as a medial ankle sprain. The conservative treatment of posterior tibial tendon dysfunction is to try to put the patient in a brace such as an Arizona AFO brace to stabilize the ankle while the tendon heals. This is very effective in patients whose foot is not too flat and early on in the disease. In addition, sometimes we use platelet rich plasma, which is growth factors in your own blood. However, most patients with posterior tibial tendon dysfunction undergo surgical intervention. The surgery consists of replacing your posterior tibial tendon with one of your toe tendons (Do not worry, you have two tendons to each of your toes – you can still move your toes.) and restore your arch with some combination of bony procedures. We restore your arch by cutting your heel bone and shifting it over in one or two places and sometimes using a cadaver bone to prop up your arch as well. 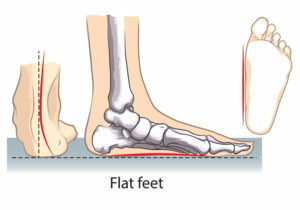 Sometimes we will fuse some of the joints on the inside of your foot in order to stabilize your arch. Which operation you need is determined by your MRI, your x-ray, and of course your clinical exam.